The Boker Solingen Scout Lightweight is a full size, light weight folding hunter that combines traditional design, elegance and functionality with modern manufacturing and materials to deliver a utilitarian design that is both functional and beautiful. A satin finished D2 blade is housed in lightweight Black G10 handles with contrasting Orange G10 inlays and a rock solid back lock. Brand new item direct from Boker Knives. Blade: The German made, D2 tool steel blade has a beautifully sweeping clip point blade traditionally found on folding hunters. A generous nail nick on the blade makes for easy opening while the hollow grind and fine point allow the Scout to slice and pierce with ease. 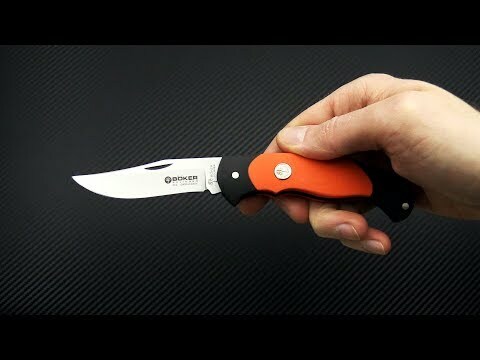 This folding hunter delivers big knife performance in a small knife package. Handle: A classic folding Hunter-style handle is delivered with modern execution in linerless Black G10 handles inlaid with high contrast Orange G10 for durability and visibility. The inlays give a traditional "bolstered" look while making this iteration of the Scout relatively light weight tipping the scales at 5.6 ounces. A solid, stainless steel back lock is housed in the handle and is solid and smooth to operate. A large hole at the pommel allows for lanyard attachment. The front scale sports the Solingen "Tree Brand" shield. The Scout does not include a pocket clip.